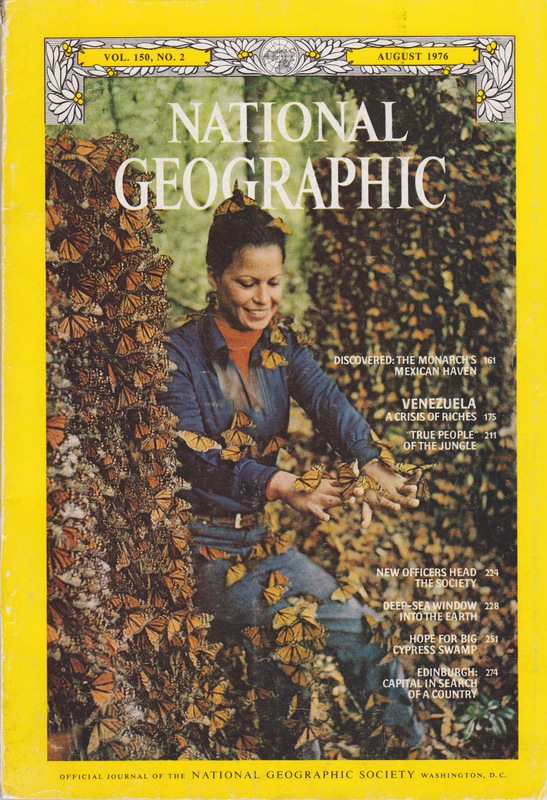 Forty one years ago today, January 9th is celebrated as the day the Monarchs winter habitat was “discovered.” The woman who led the discovery, Catalina Aguado, was born in Michoacán, the Mexican state that is home to the butterflies wintering grounds. Catalina is the only living member of the original team featured in the following 1976 National Geographic article. “In our search for the overwintering place, years passed, years of frustration. Norah, late in 1972, wrote to newspapers in Mexico about our project, asking for volunteers to report sightings and to help with tagging. Ken Brugger proved the key that finally unlocked the mystery. In a letter written in April 1974, Ken reported seeing many monarch butterflies in the Sierra Madre flying at random as if dispersing from a congregating site. Ken Brugger doubled his field capability by marrying a bright and delightful Mexican, Cathy. Late in 1974 he wrote of finding many dead and tattered butterflies along the roads in a certain area. “You must be getting really close,” we responded. These butterfly remains suggested that birds had been feeding on large flocks of monarchs. The complete article is available to read online here. This entry was posted in Angangueo Michoacán Mexico, Gloucester Massachusetts, Monarch Butterfly, Monarch Butterfly Migration in crisis and tagged Catalina Aguado, Discovered: The Monarchs Mexican Haven, Fred Urquhart, Kenneth C. Brugger, Michoacán Mexico, National Geographic on January 9, 2016 by Kim Smith.